It looks tempting and tastes delicious; it is the most loving and favourite fruit of many, the king of summer and India’s national fruit, yes, it is “Mango”. It is really difficult not to get fascinated by its sweet and sourly smell and beautiful shinny bright colour. In India we love to have Mangoes in Pickles, shakes, chutney, cooling drinks etc. We use it in ripe as well as in raw form. This is the season of mangoes and I decided to make something with it before the season ends. 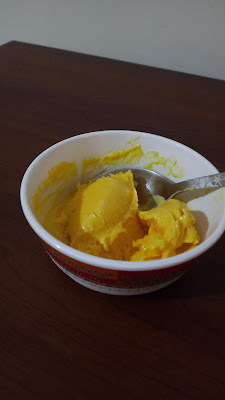 So I found an easy Mango Ice-cream recipe on YouTube with only 3 ingredients. I tried and it came out delicious. So this time I am sharing Mango ice-cream recipe with you all. Make the paste of mango pulp in mixer and then add fresh cream with condense milk in it. Just give it a blend for 2 minutes and you will get a creamy and nice textured paste. Put this paste in an air tight container or whatever container you have just cover the paste with aluminium foil before putting the lid. Keep it in freezer for at least 8 hours. Your Mango ice-cream is ready to eat. Note: As this was my first time, I felt that it would taste more delicious if your pulp would be little sour. Also you can add some dry fruits or Tutti frutti (candid fruits) in it. You can add more condense milk or sugar as per your taste. You can also adjust the quantity of ingredients according to your requirement. The above ingredients quantity will give you a good half kg ice-cream brick.